If you are upgrading your operating system to Windows 8 and your old monitor is not touch-ready (like many current laptops), you will be forgiven for feeling disappointed. My laptops are on Windows 7 and touch-screen capability is not an issue but with Windows 8, I want to be able to do that on my old Acer monitor. There is a tool for that - the Apen Touch8. AP reported that the device was unveiled this week at the International CES, an annual showcase in Las Vegas for the latest smartphones, tablet computers and other consumer-electronic devices. 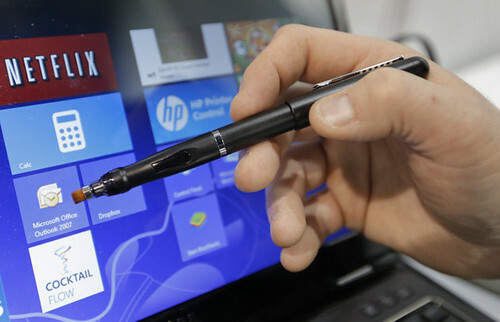 It is a cordless pen that works in tandem with an attachment that plugs into the Windows computer's USB port. Windows 8, Microsoft Corp.'s effort to make desktop and laptop computers work more like tablet computers, was released in October to mixed reviews. A major problem is the fact that many of the features require a touch-screen monitor to work, making the experience unpleasant for those with older machines. Apen Touch8 offers a way for those with older computers to experience the newer touch-based functions. You can expect this to be available in Malaysia a month or so after that. I expect that to happen in April or May 2013, but $80 (RM240) for a 'pen' would be a bit pricey I think. I'll stick to my mouse. Technology is advancing at such a rapid pace.